(CNN) -- World number two Roger Federer made a successful return in his first match since losing the Australian Open final in January, beating Frenchman Marc Gicquel in straight sets in the second round of the Indian Wells Masters in California. 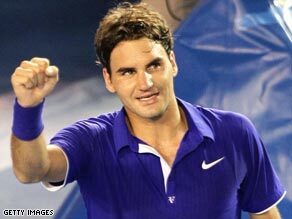 Roger Federer eased into the second round in Indian Wells in his first match since his Melbourne defeat. Federer has been suffering from a back injury since his defeat by Rafael Nadal in Melbourne, but the three-time Indian Wells champion needed just 84 minutes to progress 7-6 6-4 against the world number 52 Gicquel. The 27-year-old Swiss rained down 12 aces and won 92 per cent of first serve points as Gicquel failed to even push his opponent to a break point. Federer will now face big-hitting Ivo Karlovic in the third round after the Croat beat Sergiy Stakhovsky 6-4 6-2. World number four Andy Murray also advanced to the third round with a hard-fought victory over Spaniard Albert Montanes. Murray, 21, battled through 7-5 6-3 in one hour and 36 minutes in his first singles match since being forced to withdraw before his quarterfinal with Richard Gasquet in Dubai last month due to a virus. The Briton will next face Paul-Henri Mathieu, who beat Italian Potito Starace 6-4 6-7 6-4 in two-and-a-half hours. Spaniard Tommy Robredo, the 15th seed, also made serene progress to round three with a routine 57-minute 6-1 6-4 win over Igor Kunitsyn. Fernando Verdasco, in his first tournament since reaching the semifinals at the Australian Open, beat Brazilian qualifier Thomaz Bellucci 7-5 6-1, while Jo-Wilfried Tsonga won his ATP-leading 22nd match of the season with a 7-5 6-3 victory over Russian Teimuraz Gabashvili.